So. Does Welsh Hip Hop still have a Community? This was the question put as a conversation starter for the first of a series of ‘What’s up with Hip Hop’ discussions as part of the Festival Of Voice. 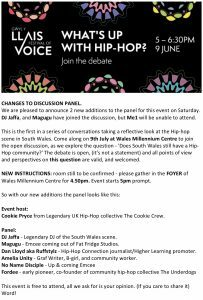 As with anything in Cardiff Hip Hop, there was apparently a ‘hoo-haa’ in advance of the event, because either people mis-read the original promo, or they felt that the panel should have been different. Unfortunately, I think this meant that some people that would have benefitted from being there, weren’t there. I have to say massive props to Dregz for arranging this, and for providing an extremely important space for people to have this reflective discussion. If we can’t reflect on our scene, how can we progress in a productive way? The ‘panel’ was there as a snapshot of Cardiff’s Hip Hop community (because yes, of course we have one). The discussion was open to everyone there, and not focussed on the panel. Cookie Pryce of the legendary Cookie Crew, was there as our host and her insight as an outsider to our scene, as well as her knowledge of wider Hip Hop culture added an extra depth to the discussion. It was great to see so many faces in the room, everyone with different experiences and backgrounds and I particularly valued the contributions from Oort Kuiper and Asha Jane. There was a lot of discussion about social media, and about promotion/promotors. Social media can work in our favour but it has also fragmented things – when I first started breakin’ there was one website to find out about all events across the UK. Now everyone has their own event page on facebook, and people often miss out on things if they aren’t in the loop. I also find, as some others in the room did, that social media can put an unwanted pressure on us to ‘do’ social media posts etc. taking away from the joy of being together and creating. I would say though, that everyone I knew in that room was not via the internet – I’d seen them perform or attended gigs and events with them. The process of getting to know and meet somebody has been speeded up with Instagram and Twitter, but physical interaction is what cements relationships. There was discussion about promotors needing to work more closely together to ensure that they don’t clash. We can’t support everything, but if we support each other, including sharing events on social media, rather than only driving forward our own brand/agenda then we all benefit. Dan made an interesting point when he said something along the lines of letting go of Hip Hop. Now I’m not going to do that but it has definitely changed from what it once was and I understand what he’s getting at. I would add to Jaffa’s explanation of Hip Hop purists recognising experimentation, play and mistakes as being the basis of the culture, to say that for me community is also the essence of what it’s all about. People like Rufus Mufasa are leading the way, smashing boundaries at Hay Literature Festival and drawing in new audiences across Wales. In our pre-discussion preparation there was quite an intense conversation about what we actually mean by Hip Hop, and this is perhaps a question for a future debate. Including younger people in these discussions was raised a couple of times, and this is something which we all need to be mindful of. There were young(er) people in the room, but the very nature of a formal discussion is not inclusive, so we need to be taking this conversation out with us. Myself and Magugu were speaking on our way up to the room about the change in the younger generation, whereby they are creating music at home, but not putting on events to share their music. This is a complex situation, which also feeds into the discussion about social media, which is the norm for young people now. It is vital that we support new artists coming through, in whatever way they want us to. There is a disconnect between the elements of Hip Hop and the Hip Hop community as a whole. Many of our Bboys only train for fitness or to battle, rather than to party or exchange. Graffiti writers aren’t necessarily into Hip Hop music. Is this necessarily a bad thing? I don’t think so, but if people want to be a part of a wider community, which some of them do, then we need to make sure that we’re open and inclusive, and people that want to be a part of this conversation need to make themselves known. Last Saturday of every month – The Hold Up Open Cypher at Oner Signs. June 30th: Hip Hop festival at Cinema & Co, Swansea including a showing of Style Wars. 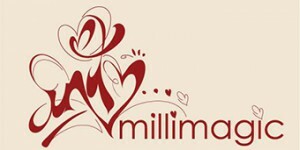 https://millimagic.com/wp-content/uploads/2014/09/millimagic2-300x150.jpg 0 0 amelia unity https://millimagic.com/wp-content/uploads/2014/09/millimagic2-300x150.jpg amelia unity2018-06-10 11:33:032018-06-10 18:12:45So. Does Welsh Hip Hop still have a Community? Nicely done, definitely some things to consider and put into action now. I think Cookie Pryce was right about documenting Welsh Hip Hop. This is something I’ve considered before but with this new conversation fresh in our heads I think it might be a good time to try and make it happen. This will be something I’ll try and oversee with as much assistance as everyone can give. Fab! Totally agree – I’ve been researching into history of the Welsh graff scene recently, and a bit about DJing, so will put some words together at some point. Happy to support you whatever way I can.